Johannesburg - South African swimmer Chad le Clos may have won gold in London, but will have to settle for second place in a survey of "swoonworthy" Olympians, according to a survey conducted by a dating website. Fellow South African swimmer Ryk Neethling beat Le Clos in survey of 2400 members of the dating website AshleyMadison.com. 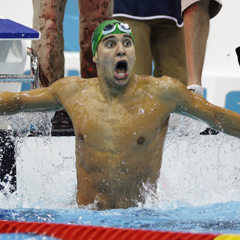 "Chad le Clos not only returns with his much coveted gold medal. He was judged as being second only to Ryk Neethling as the most swoonworthy Olympian," the site said on Thursday. Members of the service were told to vote for the Olympian "with whom they most fantasise about engaging in an affair". Swiss tennis player Roger Federer was their number three pick. South African gold medal rower Sizwe Ndlovu came fourth, with Le Clos' swimming team-mate Cameron van der Burgh in fifth place. The surveyed members were less enthusiastic about South Africa's female Olympians, preferring American and Italian swimmers. South African triathlete Kate Roberts was the only South African woman to break into the top five.